"I feel like I’m insane!" Gene Hackman’s conservative senator exclaims mere moments after he had been so fooled by Nathan Lane’s drag masquerade as an old-fashioned housewife (while pretending to be the prospective mother-in-law of Hackman’s daughter played by Calista Flockhart), that the senator had raved, "they don’t make women like that anymore." And although he’s in a state of shock because he’d been hoodwinked as a straight man, one of the most endearing aspects about The Birdcage is how well the filmmakers and actors worked together to establish characters that we instantly understand even without language. 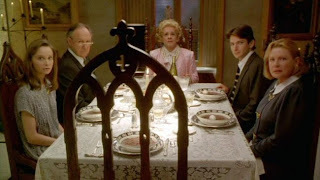 For example, in an earlier act when Lane enters the frame wearing a suit – initially ready to play the part of "the uncle" of the biological son (Dan Futterman) of his partner (Robin Williams) whom he'd raised his whole life – we can feel the heartbreak, tension and dismay practically waft from the screen directly into our living room. A film about being true to who you are and the true (and evolving) definition of family, while The Birdcage may have been behind in the times with regard to gay stereotypes, it was ahead of its time in foreshadowing the progress this country has made in the fight for equal rights. Nearly twenty years ago when the MGM/Fox film was released, a modern family that’s accepted on the same level as the one on Fox’s contemporary ABC sitcom Modern Family was just a hopeful fairytale that gay parents would’ve undoubtedly raised their child on, telling him tales of future acceptance to ensure sweet dreams at bedtime. Roughly twenty years later, that dream has become a pop culture reality even if the U.S. is still slow to grant gay couples the equal rights they deserve in life. And while yes, it’s slightly dated, it’s also anachronistic given its forward thinking approach as we watch the gay leads plan for their future together (signing palimony papers and discussing joint burial plots) and marvel at the realization that the 1996 blockbuster is in all actuality a remake of a foreign film that had been released nearly twenty years before that. Thus The Birdcage is part of a much larger conversation that's been going on for over forty years on screens both big and small. 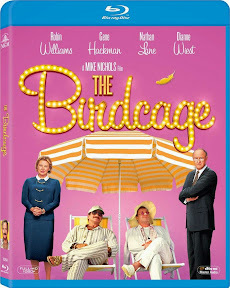 Optically The Birdcage has always been bombastic and bright as noteworthy cinematography and an emphasis on visual storytelling has been a trademark of director Mike Nichols since the beginning of his auspicious career, as evidenced in Who’s Afraid of Virginia Woolf? and The Graduate in particular. But now that the film has been transferred to stiletto-sharp Blu-ray high definition, the vibrant world of not only Miami but also the dream factory of the "fairy dust, fairy dust, fairy dust" and "Fosse, Fosse, Fosse" filled club the men run below their South Beach apartment comes wondrously alive. Not only can you see each and every sequin, seam, and false eyelash but you can practically feel the texture of the fabric of The Birdcage’s costumes, with which the onscreen actors and offscreen filmmakers (including future helmer Rodrigo Garcia who worked on the film as a camera operator) brought so delightfully to life. And while it might threaten to drive a straight-laced, right-wing senator crazy, it’s exactly the thing to drive a mainstream audience into crazy fits of laughter with enough empathy and open-mindedness to help ensure that a prejudicial society (rather than its characters) are the recurring punchline. Mike Nichols’s old comedy partner Elaine May adapted this wildly raucous remake of the ’78 foreign film La Cage Aux Folles that managed to remain both true to the plot and even a majority of the dialogue of the original work but ensure that leads Robin Williams and Nathan Lane would have plenty of room to improvise. Despite its tremendous box office returns, upon its release reaction to the work was somewhat divided. Namely, half of the audience seemed unable to look past the stereotype embodied particularly by Lane as Albert, the partner of Williams’ Armand who also works as the headliner at their Miami South Beach drag club. Meanwhile the other half of the audience was extremely impressed by the way the actors transcends the stereotype to truly get straight audiences to look past orientation and empathize with the couple when Armand’s son begs them to play straight for his fiance’s extremely conservative parents (Gene Hackman and Dianne Weist). While I can see both sides of the argument, I tend to lean towards the latter reaction as Nichols’ film marks the first gay-themed film that I ventured to the theatre to see growing up as a straight, suburban teen. The fact that I wasn’t alone in the audience as a heterosexual fully involved in the plight of the characters to me makes the film a resounding success in subtly getting the message out about tolerance, acceptance and respecting everyone’s rights to live as equals. Yet by adding in a spoonful of sugar, the filmmakers manage to consistently leave viewers in hysterics – smiling and laughing at something we may not have otherwise experienced while opening our eyes to other points-of-view. 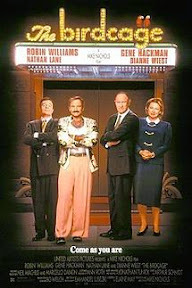 With a far superior third act to the original film that works better on both a comedic level with Lane managing to win over a clueless Hackman as the son’s old-fashioned homemaker "mother" and likewise winning back our respect for their selfish son with some tender declarations, The Birdcage remains one of Williams’ most triumphant comedies in a decade that also scored the actor a hit in another drag related comedy, Mrs. Doubtfire.